Kendriya Vidyalaya No .1 Tezpur Recruitment 2018 : Kendriya Vidyalaya No.1 Tezpur has recently issued a recruitment notification for Post Gratuate Teacher positions. According to the latest Kendriya Vidyalaya Tezpur Recruitment 2018 , Kendriya Vidyalaya No. 1 Tezpur invites applications from the intending eligible candidates for preparing panel/ appointment of Contractual Teachers for the under mentioned posts (Session 2018-19).We have discussed about this KV recruitment below. 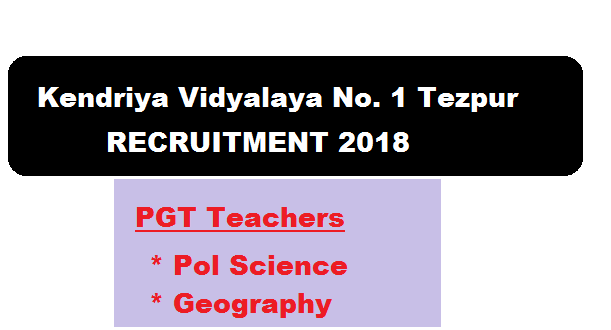 In this section, we will be mentioning details about the Recruitment of PGT Under Kendriya Vidyalaya No .1 Tezpur, Assam Recruitment 2018 with all the important requirement criteria to apply for the posts. Age limit : 18 and 65 years respectively as on date of application. a) Two years integrated Post Graduate M.Sc. Course of Regional Institute of Education of NCERT in the concerned subject; or Master’s Degree from a recognized University with at least 50% marks in aggregate in respective subjects. Desirable Qualification: Knowledge of Computer Applications. The selection procedure Tezpur No.1 KV recruitment for PGT may include a written test, proficiency and/or performance test, practical classroom observation and personal interview. Two copies of recent photograph (size 35 x 45 mm) facing camera, out of which one duly self attested and one without attestation should be affixed with the application form. Self Attested photocopies of all the educational qualifications, academic and professional, mark-sheets for all the years, degree/ diploma certificates starting from Senior Secondary/ Intermediate to highest academic/ professional qualification the candidate possesses, all certificates in claim of CCA, achievements/ distinction in Sports, Literary activities, Scouts & Guides, NCC, NSS etc., class X certificate for proof of date of birth, experience certificates etc. duly tagged with application together (All Certificates shall be self attested). Download the prescribed Application Form published with this advertisement, Fill it properly and duly filled application form must be brought in the prescribed form after downloading the same from the website of the Vidyalaya www.kvno1tezpur.edu.in and submit the same on the date of Interview i.e. 10th July 2018. All applicants must fulfill the essential requirements of the post applied for and other conditions stipulated in this advertisement as on 04th July 2018. Before applying they must satisfy themselves that they possess the essential qualifications prescribed for various posts. The applications of those candidates not fulfilling the essential qualifications and other requirement will be summarily rejected and no correspondence will be made in this regard. Applications not filled correctly and not as per the ‘Guidelines’ are liable to be rejected and the onus of such rejection would be on the applicant(s). Qualification, mark-sheets, other certificate (s) etc. (iv) Not possessing the degree/ desired qualification up-to cut off date. (v) Not fulfilling any of the laid down eligibility criteria by cut off date. (vi) Incomplete application or application not received on proper format. A candidate must apply separately for a post. A candidate appearing for the written examination must bring with him/her a Pen, Pencil, Rubber and other stationary for examination purposes. The list of the short-listed candidates for interview will be available on the Vidyalaya website. The short-listed candidates will be sent e-mail for appearing at the interview to be held at Vidyalaya premises.